Thinking of setting up your own ecommerce store? This can be a great business venture as it is such a gigantic industry, plus it is an operation that you can quite easily run from the comfort of your own home. It is no surprise that so many new e-commerce stores selling all kinds of products are appearing each day, but how can you go about setting up your own store and find success in such a competitive marketplace? It can actually be relatively straightforward but there are a few key steps to take. Read on for an overview of setting up and running your own e-commerce store. The first step will be to decide what products you want to sell. This should be an item which is in-demand but also products which you have an interest in so that you can take pride in your work. As it is such a competitive marketplace, you need to ensure that your products are of the highest quality whether they are sourced from a supplier or if you make them yourself. Domain Name: Once you have identified what products you will sell, you can then select a relevant domain name – make sure that it is memorable and easy to spell. Web Hosting: Next, you will need to find a suitable place to host your website with experts like bestwebhosting.co.uk being a good option for e-commerce websites due to the speed, reliability and free website builder. Shopping Cart: You will also need to find shopping cart software so that your customers can easily and safely shop at your store. Web Design: Much like a physical store, your e-commerce store needs to be attractive, easy-to-navigate, modern and kept up to date. It must include professional standard photographs, detailed product descriptions, customer reviews, and contact information. You can either use a Content Management System (CMS) or use the services of a web designer to design the site. Payments: An e-commerce payments system will allow you to accept and handle payments through your store. You can use a payments processing company and/or open a merchant account with your bank. Registering: It is important to remember to register your business as either a sole trader, a limited company or partnership with HMRC prior to commencing your operation. Legislation: There are a number of laws for the e-commerce industry in the UK which you need to familiarise yourself with before selling anything online. The final step will be advertising your e-commerce website. Internet marketing is a highly effective way to increase your visibility and boost awareness about your store while being active across social media can also work well for increasing awareness and accessing your target audience. These are the main steps to take to set up your own e-commerce store. This can be a fun and rewarding industry to enter with the ability to run the store from your own home, but in order to succeed you will need to sell high-quality and in-demand products, provide an easy shopping experience for the consumer and take steps to make your store as visible as possible online. The internet has made it possible for literally anybody to go into business for themselves. With demand for virtually any product or service in existence, savvy marketers and entrepreneurs have found ways to fulfil business niches and make a tidy profit. Ecommerce websites in particular have become popular with the B2B and B2C model, and make it very easy for individuals to find the best prices on any product or service. While the bureaucracy surrounding internet-based businesses is less so than brick and mortar establishments, there are still many areas where the same concerns apply. One of those areas is in the legal department. Below, we’ll review why you should carefully consider retaining the services of a lawyer for your ecommerce website. Even small online businesses have to keep track of their books. This is not only because you want to manage your revenues and expenses carefully, but also because of tax concerns and any potential legal issues with the government. Business accountants can be procured for surprisingly reasonable rates if you have a small ecommerce website. You do not want to face an audit or other scary situation involving the government without having your finances in clear, organised order. As such, looking into professionals who provide these services – even if you are a small business – is absolutely recommended. An accountant will advise you to keep your overheads down as this is an effective way to grow your small business fast. Here’s a good resource from Butlers that outlines other ways to save money for your business. Most ecommerce websites and businesses operate on very slim margins. This means that a complaint or dispute can wreak havoc on your bottom line. If your website becomes large enough, then you will sooner or later be a victim of fraudulent purchases. In some cases, credit card thieves use stolen information to purchase products from you. In other cases, a customer orders a product and then claims that it never arrives. Both of these situations can lead to charge backs, losses and frustration for your small website. A lawyer versed in these areas can help you protect your business and ensure that these fraudulent events do not eat away bit-by-bit at your website’s success. While it may be rare if you’re a small ecommerce website, there will inevitably be complaints from customers – some of them involving threats of legal action. This often arises due to lost packages, slow shipping times or discrepancies between product descriptions and actual products. A lawyer versed in commercial law can help you craft an airtight terms of service agreement that will protect you in any and all cases. This can also be translated into laymen’s terms and referenced across multiple areas of your website, as a way to head off any potential complaints. If customers are aware of the terms and conditions prior to ordering, then they are much less likely to complain or otherwise feel aggrieved. Having basic legal protection and clarification when operating any commercial business is highly recommended and absolutely essential. Between customer complaints, potential fraud and the need to cover your bases for tax purposes, retaining a commercial lawyer is just good business sense. When you develop a website, your home page is probably the most important page on your site. It’s your website’s shop window and viewing your website’s home page is usually the first contact many online visitors have with your organisation. Below are some tips you can use to create the perfect home page. Your website should have a clean design like the UAV Air website has (see below). When a website is not cluttered, it is much easier for visitors to read your content and find the information they are looking for. Navigation is also a key issue. Your home page is a gateway to the rest of your website. Make sure you have an easy-to-navigate menu system that links to all of the main web pages on your website. Different home page structures work for different businesses. However, there are certain components you need to include in every home page. You should include all of your contact details, relevant images, information about your business and the products you provide, your business updates and any other information you think needs to be seen instantly by customers. Your website tells your visitors a lot about the organisation that owns it. Never cut corners and always ensure that your website looks professional and fresh. The use of high resolution images, professional videos and well written sales copy will go a long way towards impressing potential shoppers and customers. Your website’s home page is not set in stone and you can change it at any time. All of the leading online businesses understand the importance of testing and tracking and you should follow their lead. These organisations continually change images, headlines, calls to actions, colours and every other component of a website’s home page, to see what works and converts the most website visitors into shoppers, customers and subscribers. Testing and tracking is not the only reason you should be modifying your website. There are times of the year when a website’s home page should reflect a seasonal event that’s taking place. The most common seasonal events you should prepare your home page for include Christmas, the January sales, Easter, Halloween and any other important occasions that take place in your area. Making some simple changes will transform your website into a more welcoming place for website visitors at these times of the year and is a clear indication that you care about those who visit your website. Everyone who visits a website is a potential shopper or customer. However, the vast majority of online visitors view a website for a short period of time and you never see them again. A lead capture facility can address this problem. You simply add a form to your home page that asks your website visitors for their contact details. Once they submit these details, you can build a relationship with them and promote offers using email. The success of a website often depends on its home page. All of the factors above need to be seriously considered, so that your home page delivers the results you are hoping for. 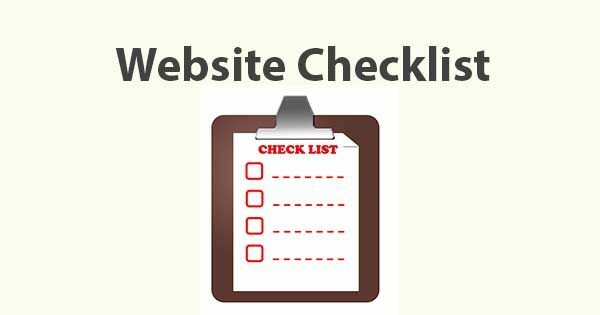 In this post I am going to take you through a useful website development checklist that will give you some ideas when building your site. It also gives you areas to consider when reviewing and improving it’s performance, helping to get the most from it. A good website forms the foundation of a great digital marketing campaign and done well can generate significant sales and sales leads. I talked in a previous post about creating an online buying cycle where you go beyond simply having a site with a good look and feel and start focusing on the online buying cycle as a whole – everything from how you are going to direct traffic to your site and the user journey once on the site, guiding users towards a micro or macro conversion. It also talks about setting up strategies to nurture prospects, converting sales leads into long-standing, loyal customers. While this website development checklist isn’t an exhaustive list, it covers all of the main areas to consider and will get you thinking beyond just the look and feel and will get you to start think about digital marketing as a whole so that you get the most out of your website. It is important to understand how you are going to drive users to your site as this will affect the site’s architecture. For example; when we have built websites for event venues, we have found that many venues have designed the site architecture around the rooms in their venue, listing each room and their capacities. While this shows off the venue well, it is more geared towards off-line marketing where sales leads have already been generated. It is not geared towards generating sales leads through digital marketing. Most people when looking for an event venue will search for the event type – ‘wedding venues’, ‘conference venues’ etc., and therefore the architecture of the website needs to incorporate this, whilst also showing off the venue at the same time. All quite obvious with a bit of thought but so often sites are designed with no consideration for how you are going to direct traffic to your site. With a bit of research, you should be able to find out how people will search for your site and will be able to set up the site architecture appropriately. Once a prospect is on your site, you want to keep them engaged and guide them towards a conversion. The call to actions on your site will vary depending on your industry, website and where they are in the buying cycle but generally you want to have your primary call to action – a purchase if it is an e-Commerce site or perhaps a call back request if a lead generation site. For those that are not ready to action this, then you want a secondary call to action such as a blog subscription so that you can get the prospect to enter into the buying cycle. It is then over to your sales and marketing team to nurture the prospect and move them towards a sale. Keeping prospects engaged requires good UX (user experience). You want to effortlessly provide them with the information that they require which means a clear, simple design across platforms. Your site needs to be designed for your target demographic. If your demographic is technology savvy, it will have a different design to a site with a non-technology demographic. A truly user friendly site requires comprehensive testing before the site goes live. Your website will be viewed on a variety of platforms and therefore it is essential that you have a responsive design. Simply designing your site for desktop and laptop computers is not enough now. Mobile devices are becoming more popular and your website needs to work on all platforms and browsers. As users use their fingers to navigate around websites, the website will need adjusting to make it mobile friendly. If mobile usage is high, it may be worthwhile considering having a mobile app built. Content marketing is an effective way of promoting your site and nurturing clients. A blog usually forms the centre of content marketing and they are becoming an essential part of a website. Have a read of my posts on creating a great blog to find out more. Social media plays a huge role in digital marketing and therefore it is sensible to have links to your social media pages and to include social sharing buttons to encourage users to share your content online, helping you to build links naturally. We spoke about call to actions but it is also important to include your contact information. There is nothing more infuriating than trying to contact a company and struggling to find their contact details. Showing your contact details clearly also helps to build trust as it differentiates yourself from less reputable companies. In order to maximise the performance of your site, it is important to set-up a website analysis system. Google Analytics is a free website analysis system that allows you to track site visitors and their user journey. It won’t automatically track conversions though and you will need to set-up goals and conversion tracking tags in Google Tag Manager. There are also lots of dashboard reporting systems that gives you a simple dashboard showing your site’s performance. By integrating back office software, you can synchronise data transfer between your CRM, ERP, stock management, accountancy, email marketing and project management systems which will help you to improve efficiency and functionality. Consider which back office applications you could integrate into your site to make your business more efficient. Marketing automation encompasses a number of things from blogging through to building specialist landing pages and lots in-between. There are a number of companies that specialise in marketing automation such as HubSpot, Pardot and Marketo. These can all be integrated into your site or if these systems are beyond your marketing budget, low cost automations like an automated newsletter system can be set-up. The security of your website is often not considered until there is a security breach. There is a number of ways to improve the security of your site with a few simple steps. Have a look at my post on 10 ways to improve WordPress security. Most of these principles apply to all content management systems and not just WordPress. Website load times have an influence on both search rankings and conversion rates and therefore it is important to make sure your website performs well. Have a look at my post on website load times. A great website needs promoting to maximise it’s performance. A good digital marketing agency will help you to direct targeted traffic to your site, increase engagement and increase sales and sales leads using a combination of digital marketing channels. If you are using a separate website development agency to build your site, it is a good idea to involve the digital marketing agency in the build too so you don’t end up making lots of amendments at a later date, increasing development costs. Happy marketing! If you have any questions, write a comment below and I will answer it as quickly as I can. For more free digital marketing advise, signup to our newsletter below. In this post I will look at the different types of content management system (CMS), helping you to find the right one for your project. Before you can start building a website, you need to decide on the system that it is going to be built in and given the value of content marketing, usually you will want a content management system for your site. There are so many content management systems on the market; some are open source and free to use, others charge a subscription fee. You can also build a customised system too. With so many on the market, choosing the right one for your project can often be difficult so in this series of posts, I will take you through what a content management system is, the difference between an open source and a propriety CMS and I will compare platforms, looking at the pros and cons of various popular content management systems.